Event planning and marketing are extremely important concerning ROI and measuring this impact can help professionals appreciate which tactics have worked and those that may need to be improved. Although this may appear to be common sense, many organisations and professionals fail to utilise these efforts properly. There is no doubt that identifying and interpreting these factors are daunting tasks and yet, such a lack of insight is quite pervasive in the modern corporate landscape. It has been shown that up to 59 per cent of all marketers have few (if any) plans in place to gauge the ROI of a conference. Even fewer know how to enact the plans in place. The main issue is that such a topic will typically involve numerous metrics and from the point of view of a marketing specialist, it can be quite easy to become overwhelmed. It is for this reason that a more cautious approach should be taken. 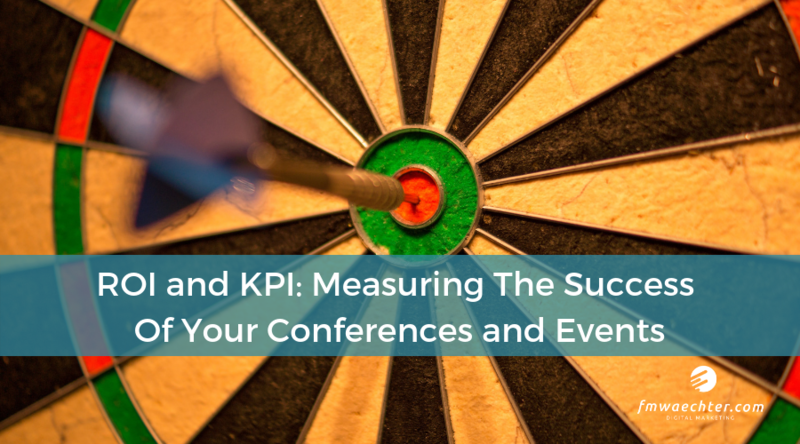 By identifying KPIs and similar influences, it is much easier to appreciate what may need attention and the best practices that should be maintained for future events. This strategy can be broken down into a handful of crucial steps. Each has its own merits and specific approaches. We should first take a look at why discerning the ROI for an event is critical regarding the success of an organisation. Let us then examine how association executives and similar professionals can leverage these variables to create a well-rounded and insightful ROI measurement template. Why Interpret the ROI of a Conference? A conference can be seen as one of the most important milestones for a company (or a group of companies). The receptive nature of all participants is an excellent means to understand the efficacy of existing marketing campaigns as well as a product appeal. Ultimately, a conference is intended to increase interest and to drive further revenue down the sales pipeline. It is for these reasons that a well-rounded approach must be adopted. The result will be a heightened ability for Professional Conference Organisers (PCOs) and decision makers to expound upon how their strategies are affecting the perception of the organisation in question. Now that a basic appreciation of the broader aspect of measuring event ROI has been established, we will delve into the different tools at the disposal of the corporate business world. Most NPOs are already well aware of how a survey can provide the insight and clarity necessary to gauge the effectiveness of a recent event. However, some will baulk at this prospect because they believe such studies are incredibly time-consuming. This makes sense in a way, for collating data from a huge event is indeed challenging. Still, this methodology must be embraced. It is a myth that a survey should take place only after the conference has finished. On the contrary, engaging with participants through online questionnaires and face-to-face liaisons during the event will help to provide additional data that may not otherwise be possible. Technology plays an important role. Mobile applications and dedicated pages within the website associated with the venue are both effective means to garner much-needed input. There can even be times when the results of such a survey are markedly different from those associated with other key performance indicators. This disparity can be quite useful, for it might be able to “fill in the blanks” about any ROI unknowns (such as the user experience and even how comfortable the attendees were). This is also an excellent way to calculate brand lift; how effectively the event impacted the perception of the brand through previous marketing strategies (2). Which sessions and days drew the highest number of participants. Speakers and topics that seemed to grab the attention of the clients. Stalls and exhibitions that fostered the most interaction. How can this be accomplished? Traditional methods such as the surveys mentioned above represent more organic approaches although once again, technology can play an important role. The scanning of QR codes by visitors and even the use of RFID wristbands are becoming more commonplace as mobile computing power continues to enjoy an increased presence. The bottom line is nonetheless simple. Knowing which segments of a conference were appealing to the attendees is another robust means to interpret the ROI of the end-user experience effectively. These figures can then be coupled with more concrete data such as conversions. Word of mouth and similar personal feedback. Big data such as the demographics of the attendees, their professions and their regions. There are still some steps that need to be taken to focus upon the correct KPIs. The measurement objectives must be clear from the beginning. It is prudent to dedicate time to monitor online conversations and (potentially) provide feedback to any questions that visitors may have. Finally, online guest interaction should go without saying. It is often the case that event attendees will be more likely to respond to enquiries via a social media platform such as Twitter or Facebook than they would through static questionnaires. This medium is a valuable tool that should never be overlooked. Another key area of interest lies in the role that mobile applications now have within the conference management sector. These handy widgets can offer a nearly unparalleled amount of real data. Tracking relevant metrics is now a very real possibility, and little will be left to intuition. Some of the information which can be collated includes the use of networking, forum posts, the number of downloads of a specific piece of software and even the time of day that the application was accessed. These and other insights should be categorised based upon their importance as well as the relevance to the event itself. Another notable benefit of the modern mobile app is that many software platforms enable these metrics to be followed through a centralised software package. This is much more efficient when compared to tracking numerous blog responses and social media posts. Still, application monitoring should be used in conjunction with these other methods. The ability of the guest to provide the marketer with personalised insight in regards to their impression of the conference. The undeniable power of professional networking. The attendees will be impressed by this “personal touch” and may be more likely to further engage with the product or service being offered. There is no doubt that interpersonal interactions with conference guests will lead to a positive outcome. However, a word of caution should be mentioned. It can be exceedingly easy to allow this approach to overshadow the methods discussed above. It is therefore wise to set aside a specific window each day towards this task. Otherwise, valuable insight in other areas may be lost. The quantifiable costs (sponsorship, physical expenditures and the price of the venue, for example). Qualitative concerns including the time and effort spent organising, promoting and executing the conference. The sum of these two variables will represent the total cost of the event. This can also be summarised as the difference between the net profit concerning the gross profit. By understanding the financial expenditures, the logistics and the sheer effort, it is much easier to make future decisions in terms of how a conference should be held. These results can be made even simpler by comparing recent figures to past events. Was one more effective than another or did a specific event serve to increase the overall ROI massively? If so, it would be prudent to examine any differences that were present. Positive attributes can be leveraged while potentially damaging approaches can be ablated from future projects. The appeal of the venue. The number of attendees in relation to previous years. The success of any promotions and marketing campaigns. How effective the booths worked in conjunction with seminars and other presentations. Whether or not there was adequate publicity provided in advance. This type of evaluation should be scheduled well in advance of the event itself. Otherwise, the team may become immersed in other issues. Making stakeholders clear of their post-event evaluation roles will help to provide an additional layer of clarity into the measurement process. Now that we have developed a broad appreciation of some of the techniques which can help to interpret the ROI of an event, it is wise to do away with common misconceptions that are still pervasive in today’s world. To put it simply, what may have worked well a few years ago could be outdated today. The first mistake is assuming that attendees will automatically return to a conference regardless of its perception and outcome. The fact of the matter is that the sheer number of professional events has increased and no longer is it entirely necessary to attend such gatherings to glean valuable information about a company. Webinars are one example of how technology has forever modified the conference landscape. Secondly, being “better” is hardly sufficient in such a competitive environment. While there is nothing wrong with raising the proverbial bar, conferences need to be different and memorable. This will help to capitalise on ROI while influencing guests to return to future gatherings. Another fallacy is the belief that ROI can be influenced by “freebies” such as trips, hotel accommodations and similar perks. If anything, these may very well take away from the benefits of the product(s) being presented. Gimmicks are old and outdated. A good product should be able to stand on its own without the need for glitz and glamour. Another issue with this approach is that it will become immeasurably more difficult to determine if any change in ROI was the result of the conference itself or ancillary offers. Finally, trying to measure a programme that offers dozens of different seminars and topics is nearly impossible. The more metrics are present, the more muddled (and potentially incorrect) the results will be. All of these approaches can and will dramatically affect one’s ability to interpret the ROI of an event accurately. It is best to adhere to the rules listed in the previous sections to enjoy a higher level of clarity. We can now see that applying the correct measurement tools for events is necessary to determine the ROI and ultimately, to identify the core KPIs that may have had a positive or negative influence. It is only through a marriage of each of these methods that executive stakeholders will be able to accurately appreciate the impact of the approaches that have been taken. Having said this, such an analysis can be a difficult task. It may be prudent to outsource these efforts to a dedicated in-house (or third-party) team of experts. Even a professional conference organiser is likely to have a tight time gathering, collating and interpreting these variables. Executives need to be aware that implementing such strategies well in advance of a conference is pivotal to determine which factors affect the final return on investment. We should furthermore mention that the impact of each of these methods will differ depending on the demographics of the attendees. For example, a younger crowd will likely utilise resources such as social media and mobile phone applications to a more significant extent. Therefore, it can be argued that a more considerable amount of importance should be placed upon these measurement techniques. It, therefore, makes a great deal of sense to approach any seminar, symposium or event with the right tools at the right times. The methods that have been mentioned in this article are intended to provide this very same clarity. By interpreting the data collected, it is much easier to modify a particular approach or even to scrap one which may not have been producing the required results. Event management is no easy task, and it involves much more than the hands-on strategies often emphasised on the day of the conference itself. The bottom line is that the ROI of a conference can and will have a genuine impact upon the future of any corporation. Although a great deal of emphasis has been placed upon the world of digital marketing, face-to-face interactions forge strong connections, and they can be the final determinants concerning increased revenue generation. Please feel free to use this white paper as a quick reference guide as well as a resource for further inspiration.